Ampullary tumors include adenoma with/without dysplasia, adenocarcinoma, neuroendocrine tumor, and so on. They may cause clinical symptoms with jaundice, anemia, bleeding, pancreatitis, and duodenal obstruction and are found incidentally by endoscopy for other examination purposes. For the group of patients with familial adenomatous polyposis (FAP), endoscopic surveillance is recommended because of invariably developing duodenal adenomas and a risk for ampullary carcinoma 124-fold greater than the general population . However, in two studies from Japan and the USA, the progression of morphology and histology of the main duodenal papilla was limited in more than 10 years and 4 years follow-up [2, 3]. Because of causing clinical symptoms or malignant potential, removal surgically or endoscopically of the ampullary tumors is the first consideration. Treatments of ampullary tumors include transduodenal local resection, pancreaticoduodenectomy, and endoscopic papillectomy (EP). Pancreaticoduodenectomy (PD) has been considered the standard treatment. Although the mortality associated with PD has decreased in the past decade, morbidity is still high . Transduodenal local resection (surgical ampullectomy) is a less invasive procedure compared with PD. But compared with endoscopic papillectomy (EP), the morbidity is significantly higher. Endoscopic papillectomy was first described in 1983 by Suzuki for two cases with ampullary cancer . 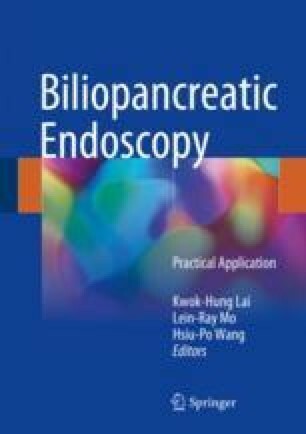 EP is now recognized as a less invasive alternative to surgery for ampullary adenomas and is with decreased cost, morbidity and good long-term result [6, 7]. The reported successful rate had been 80–90%. With increase in the aged population with many medical illnesses in each country, EP is considered more frequently than before.